[QUOTE=RickI;48045]I understand a number of kiters like to go out in squalls others don't bother to think much about it. If it is blowing, they go. I would take a look at the following clip, consider the many dozens of kiters killed and likely hundreds injured worldwide over the years in squalls and think it over again. This was shot at the Sun n Fun fly in, in Lakeland, FL yesterday. It is horrible to have so many personal aircraft many home built radically damaged in an instant and at a fun annual fly in. Want to fly a 7 m kite in that? Anyone who goes out in squalls has the opportunity, believe it. How about the winds that blew over Egmont Key ikitesurf sensor at the entrance to Tampa Bay shortly before things went ballistic in Lakeland, FL about 30 miles to the ENE? Note the classic 90 degree direction change with the onset of the squall line. This has blown kiters offshore plenty of times in the past and with far less violent squall lines. Some have made it, some lost boards and still others lost their lives. These direction changes can be ANTICIPATED, along with strong winds, if you bother to look out for it. There were nine tornados identified in the Bay area however looking at the windgraph and duration of high wind, it seems likely that other sources of high wind were present throughout the area as well. Perhaps powerful gust fronts and bursts. So, you ignore squalls/weather hazards and head out say at 10:30 am rigged with a 9 m. Having some fun until say 12:30 pm. They there is a good chance it is lights out time or a real nasty go to if you're extremely lucky. I could easily imagine kiters who ignore weather hazards or actively go out in them falling into this predictable but possible terminal scenario. Not all squalls are this lethal, just enough to make it a real bad idea to mess with any of them. Lots of guys have lost it in squalls blowing to 35 kts. Some may not believe it but you likely haven't hit a bad one or have had things go very wrong yet. I know some kiters rely on squalls for wind in some inland venues. It is tough but getting taken out by one permanently or messed up still make it a poor choice. Also, no way this is a "Florida" specific threat. Squall lines like this tear things up from coast to coast at times. We were to fly back to Ft. Lauderdale, FL yesterday but were put on a 3 hour weather hold on the tarmac in Denver because of this same cold front squall line and all the tornados and other damage going on. I understand bow echos were identified in radar images along with tornado signatures. 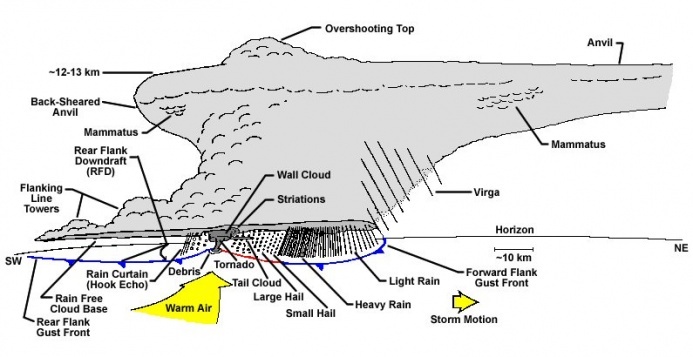 Some of the imagery suggests microbursts may have been involved too. This was the radar image around the time of the windgraph shown above. That dark red curved area is heading to Lakeland. 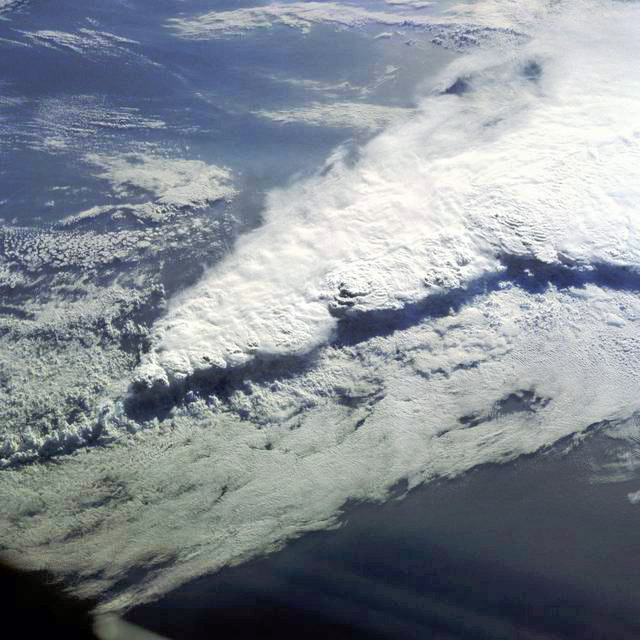 This is what a powerful squall line or collection of supercell storms can look like from space. The higher the shadow the taller and more powerful the storm cloud stack. This is an aircraft view of the one that ripped over Central Florida yesterday about 300 miles west of Naples and at 38,300 ft. or so. You can see the anvil of one thunderstorm out of many more in the squall line. 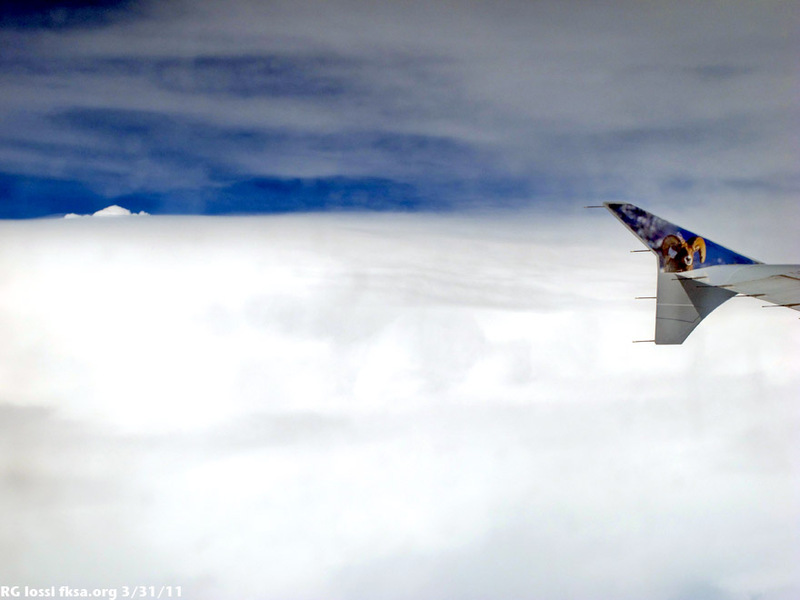 There were cloud tops still higher than we were flying, powerful cumulonimbus. Multiple gust fronts, tornados, straight line winds, lightening and hail, what is not to like? The marine forecast for the Tampa Bay area that day was for 20 kts west, more HERE with a warning about tornados on some websites. Look what the weather hazard forecast was at 6 am the same day! 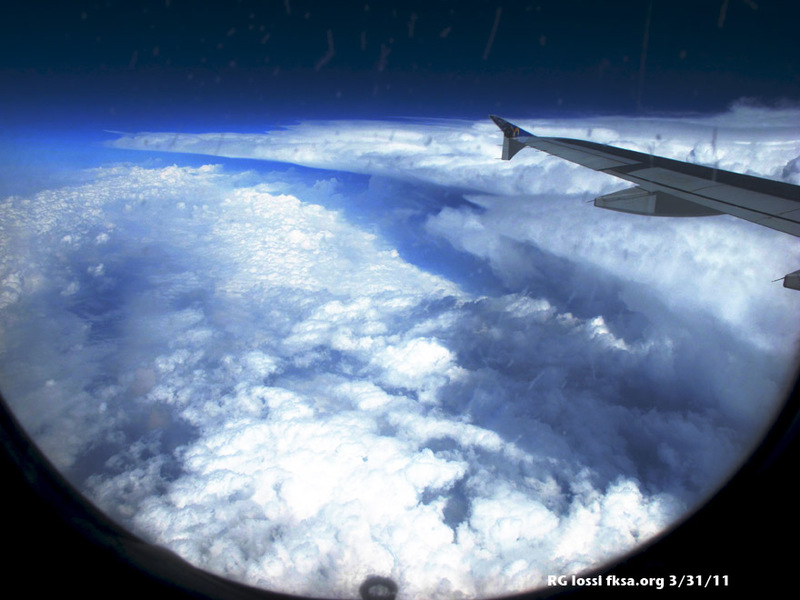 Coasting along past an overtopping cloud in the distance 7 1/2 miles above the earth. This was our approximate position at the time. 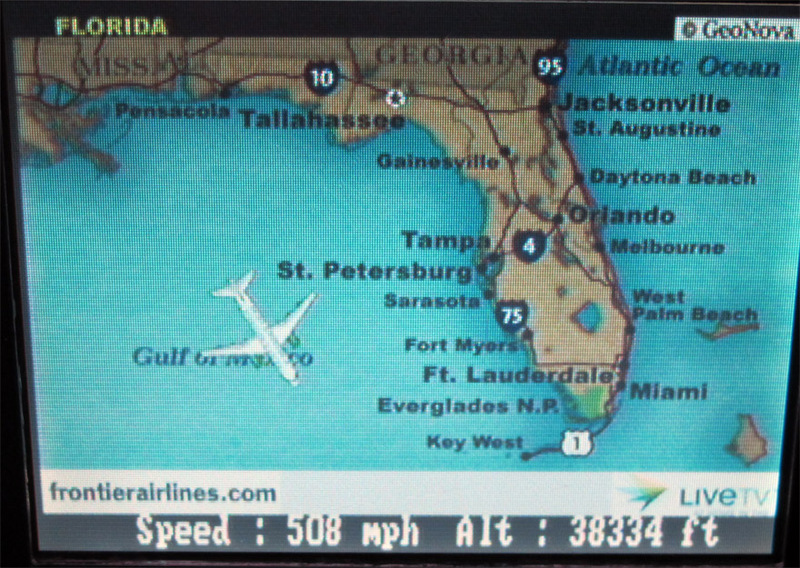 The real violent stuff was already well to the east, hence the three hour weather flight hold from the FAA.